Whey Isolates by Max's Pro Series - Big Brands, Warehouse Prices! If you want to get natures number 1 muscle building protein source available into the working muscle as fast as possible, then Max’s Whey Isolates is the product you are looking for. Made with the two highest quality and fastest absorbing whey protein sources on the market, Max’s Whey Isolates, which is fortified with muscle building amino acids as well, is the perfect post workout supplement you could ask for. 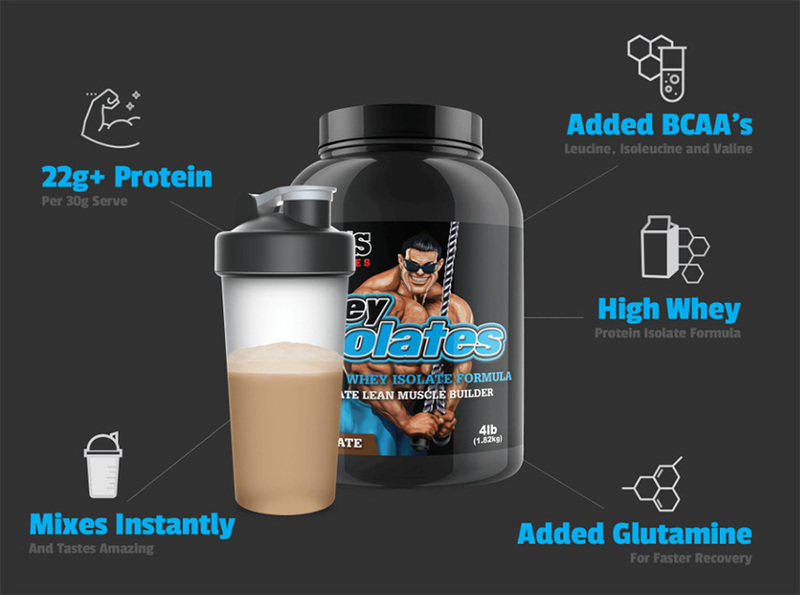 For a premium quality, pure whey isolate blend that is both delicious in flavour and nutritious in profile, look no further than Max’s Whey Isolates. Derived originally from the cheese making process, WPI is a multistage filtrated by-product that yields a high level of muscle building protein, with little to no lactose, very low fat and an abundance of amino acids that can be digested and utilised at speed for optimal muscle recovery and repair. Following the filtration phase of whey milk into whey protein concentrate, whey protein isolate and then hydrolysed whey protein isolate, whey protein peptides are enzymatically created by breaking down the connective compartment of proteins and creating single amino acid peptides to ensure optimal absorption occurs as virtually no digestion being required to utilise each peptide available. Max’s Whey Isolates is a high protein yielding, low carbohydrate, high muscle repair and growth product designed for the intermediate or advanced user in the post workout phase of training or even during the day as a high protein snack.